Mays Lick Consolidated School is a former school turned apartments in Mays Lick, Kentucky. 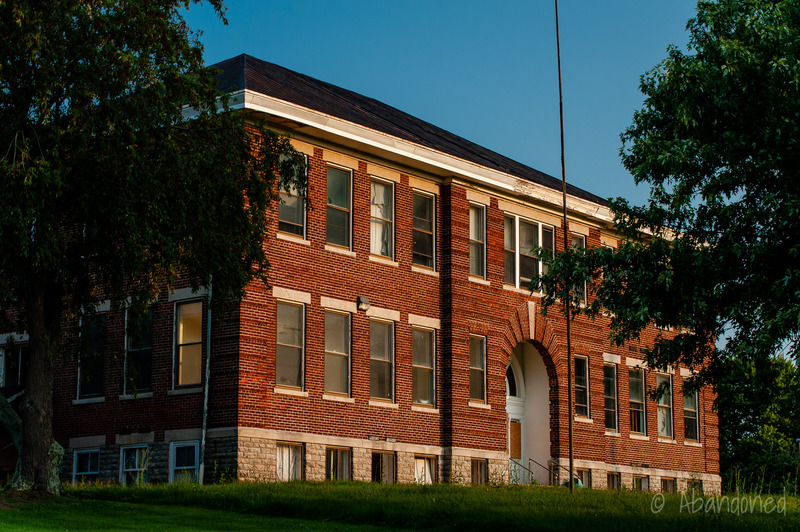 Constructed in 1909-1910 for $32,500, it served as the first high school in Mason County. Until 1960, it was the only public high school to serve the Mays Lick District. Until Mays Lick Consolidated School was built, the Mays Lick region was served by seven independent school districts. 3 The town of Mays Lick had a typical two-room village school but education often stopped past the eighth grade unless time was found to give instruction for more advanced education. Those that could afford a high school education were often sent to larger cities. The Mays Lick School was built in response to the passage of the Sullivan School Law by the Kentucky legislature in 1908. 1 3 It called for the establishment of one or more high schools with free tuition for rural children in each county. The first step in the construction of a new school was in 1909, when W.E. Pyles, a farmer, was elected as the school trustee. 3 Pyles believed that Mays Lick was the logical location for a new school, owing to its central location in the southern part of Mason County. In January 1910, Jessie O. Yancey assumed the position of Superintendent and believed in the consolidation of smaller school districts with Mays Lick. Pyle enlisted the local population in subscribing $5,000 towards the construction of the school. 3 The Mays Lick School Improvement Company was organized to finance the $32,000 project. The two-story brick building was designed by the Weber Brothers and constructed by Douglas McCowell atop a raised stone foundation. 1 It featured cut limestone sills and lintels in the windows, and brick banding in the center and quoins at the end walls. The main entrance was arched with a keystone, with a double door topped with a semi-elliptical window. The building at first was far too large for its student body and some of the rooms were rented out as an apartment for the principal and his wife. 1 Mays Lick initially had just four teachers, two for the high school and two for the other grades, and a principal. In the summer of 1910, a flood washed away a sub-district one-room schoolhouse in Arthuranna. 1 While there was a movement to rebuild Arthuranna’s school, Yancey pushed to have the students merged in with Mays Lick. 3 In June 1911, the Board of Education voted to consolidate Arthuranna with Mays Lick and to provide transportation. 1 Yancey began a campaign to have other districts merged with Mays Lick, cumulating with an election in August 1911 that called for a 20 cent tax for transportation and other school purposes. 3 It passed 134 to 90. Mays Lick was the first consolidated school in the county and the first consolidated school in the state that featured publicly financed transportation. 1 A lawsuit was soon filed challenging the tax and those transportation expenditures were found by the court to be illegal under the present statute. Public transportation to the school ended. Concerned citizens quickly lobbied the legislature to make the needed changes. In March 1912, House Bill 215 was passed. 1 It empowered county boards of education to lay out the boundaries of a consolidated school district and to levy a tax with the consent of taxpayers to establish transportation for students to the school. In 1912, a 20 cent tax for transportation and other school purposes was once again voted upon, passing 195 to 24. 3 In the following year, the tax was raised by five cents and easily passed 134 to 18. The money was well needed. In the first year after consolidation, there were seven school buses that could hold 42 each that were available to transport the pupils. The following year required nine and in 1913, that had risen to eleven. In addition, the number of teachers was increased to seven due to increased enrollment. Grades nine through twelve were discontinued in 1960 when the new Mason County High School opened on the outskirts of Maysville. 2 Mays Lick continued to serve grades one through eight until 1979. In 1981, the school was sold and the main building was remodeled into fifteen apartments 2 by Moe and Associates. 1 The gymnasium was re-purposed as a post office. 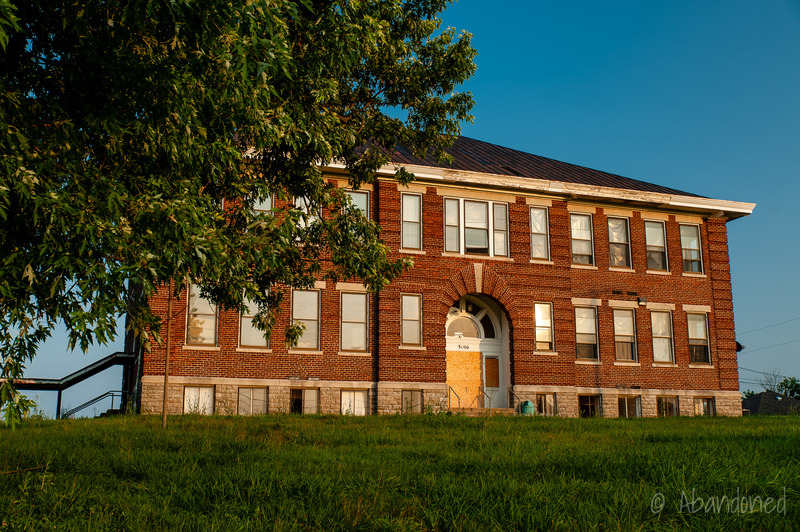 In July 2013, the Mays Lick School Apartments was closed due to a non-functioning sewage package plant, 4 which served the apartments, post office, a doctor’s office, and a gasoline station. Due to a lack of routine maintenance, the plant was outputting raw sewage into a creek. The apartments were vacated and later abandoned. 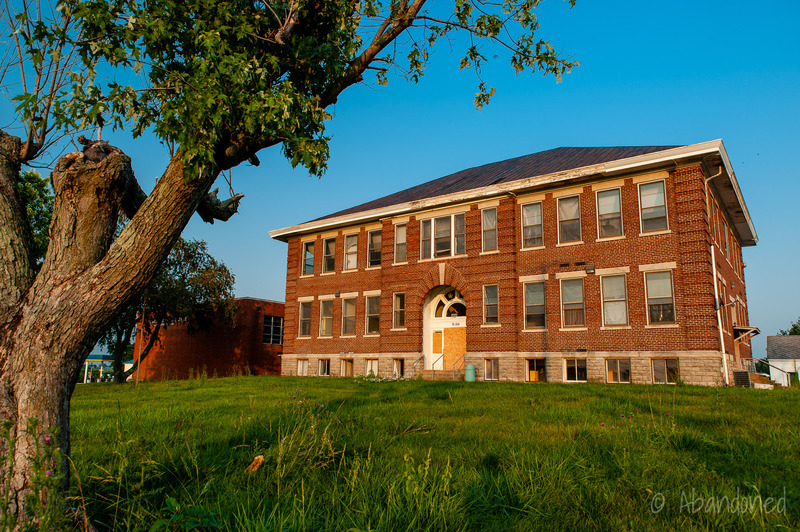 In March 2016, William Lawrence, of Lawrence Development and Rental Properties, began the process of acquiring the former May’s Lick School. 5 It was not until March 2017 that the transaction was finalized. On September 30, Lawrence held an open house for the community to showcase the building’s renovations. 5 The first phase of renovations, consisting of eight apartments, was completed in 2018. 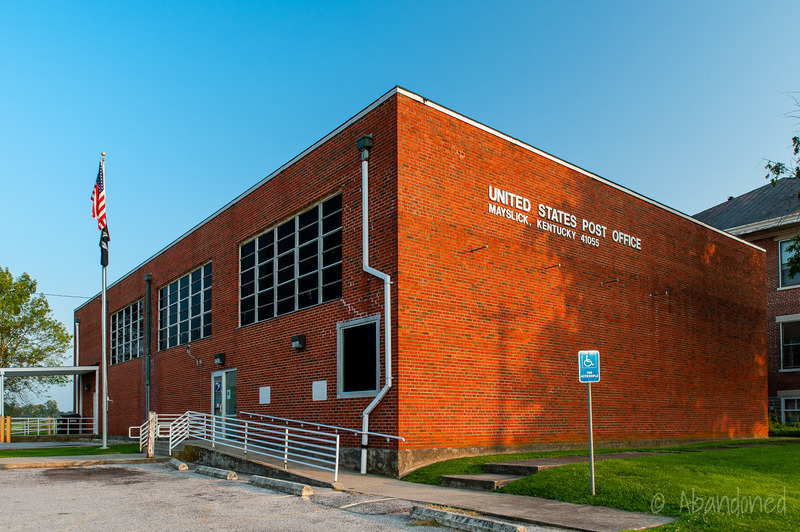 The former gymnasium was converted into a post office. United States. Dept. of the Interior. 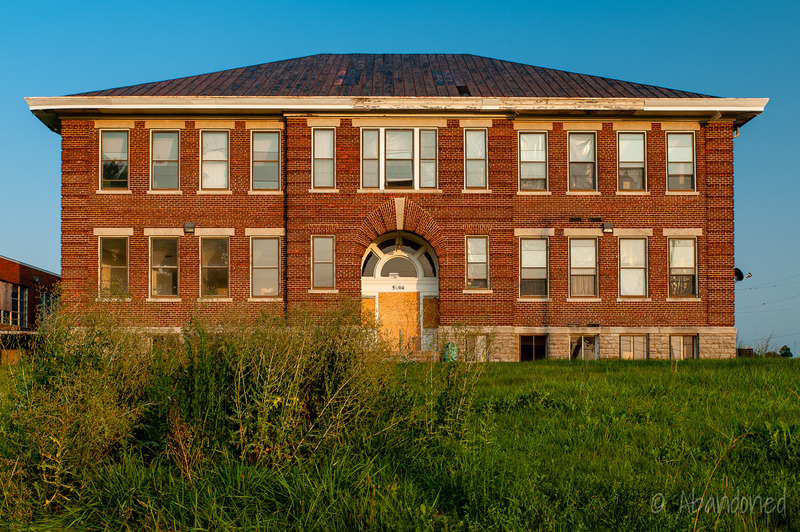 Mays Lick Consolidated School. Comp. Gloria Mills. Washington: National Park Service, Mar. 1973. Kentucky Heritage Commission. Web. 5 Aug. 2014. Article. Raitz, Karl, and Nancy O’Malley. “Mayslick.” Kentucky’s Frontier Highway: Historical Landscapes along the Maysville Road. Lexington: University Press of Kentucky, 2012. 270-71. Print. Gaither, R. F. “The Mays Lick Consolidated School.” Atlantic Educational Journal 9 (1914): 17-20. Print. Toncray, Marla. 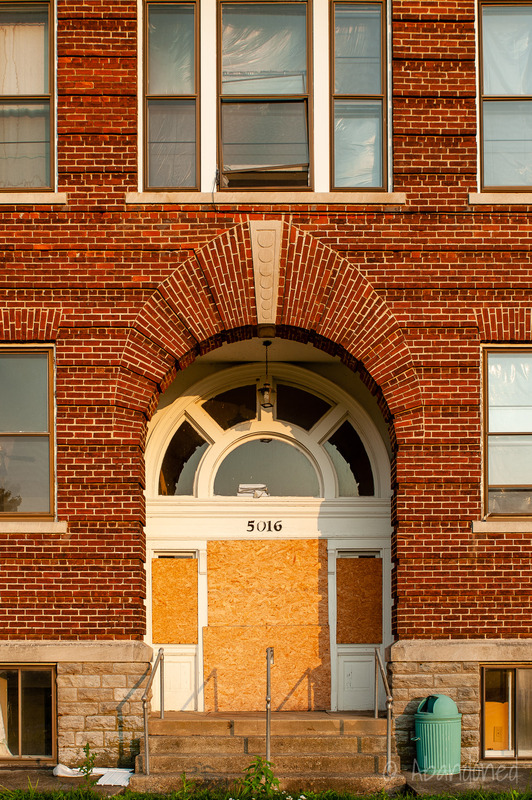 “Apartments closed due to health concerns.” Ledger Independent [Maysville] 6 Aug. 2013: n. pag. Print. Huff, Damon. “Community landmark gains new life.” Ledger Independent [Maysville], 22 Sept. 2017.